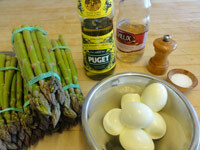 Asparagus and egg is a classic combination. Here is a delicious new way of serving them together. 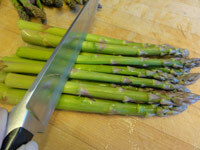 Trim the tough ends off the asparagus. Lay the asparagus on a baking sheet, coat with olive oil, sprinkle with salt and pepper, roast on the middle or top shelf of a 450 degree oven until tender when pierced with a fork or an asparagus spear droops when lifted. Mix the eggs with the olive oil, vinegar, and salt and pepper in a bowl. 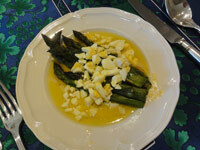 When ready to serve, transfer the warm asparagus to warmed plates, and spoon over the vinaigrette. Serve with French bread. Note: To hard cook eggs place the eggs in a pan covered by an inch with cold water. Bring to a vigorous boil — then turn off the heat, cover the pan, and set the timer for 14 minutes. When done, immediately run the eggs under cold water to stop the cooking and crack the shell for easier peeling.